The concept of flies tied on tubes is rapidly gaining in popularity. 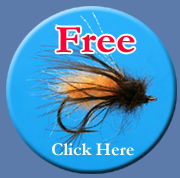 There are many tactical advantages of utilizing this style of fly for steelhead. In Tube Flies for Steelhead, veteran steelhead angler Rick Kustich uses an easy to understand style to explain the benefits of tube flies and demonstrate step-by-step tying instruction for patterns that have proven effective on both Pacific Coast and Great Lakes rivers. The DVD includes complete tying instructions and recipes for six effective and attractive tube fly patterns as well as tips and ideas for modifications to meet specific fishing conditions. Rick Kustich is co-author of the acclaimed book Fly Fishing for Great Lakes Steelhead and has fly fished for steelhead for nearly thirty years. He is a writer, photographer, fly tyer, and instructor and his work has appeared in numerous national and regional publications. Rick lives in Grand Island, NY on the banks of the Niagara River. Filmed in BC and Oregon, Steelheading Outside the Box is the most insightful, technique focused steelhead film in over twenty years. There are no indicators or dead drifted nymphs in this film, just deeply sunk swinging flies jacked by Skagit Flight and Skagit Short shooting heads, wicked looking custom Intruders and water spitting popping bugs chugging behind the latest high tech Scandi heads; it's steelheading Scott's way. 120 min Available January 2011, Be First In Line! Save: $3 + shipping Whether he's dropping a cone head Prom Dress through 10 feet of cold winter flow to a short piece of holding water or popping a foam lipped Ska-opper over a roily boulder patch, Scott knows where fish live and how to make them respond. Few "How To" films deliver with results. From the intimate coastal streams of Northern BC to his home waters in Oregon, Scott Howell goes fishing and shares the techniques he developed throughout is career and lands over a dozen wild steelhead in the process. Scott's philosophy: "If that steelhead intended to eat your fly, it would have". You shouldn't worry about the ones that got away or the short strikes, dull pulls and plucks. Enjoy and respect them all. But cherish the ones you get to touch. Skagit Master Volume 2 Featuring Scott Howell is the perfect companion to Skagit Master Volume 1 Featuring Ed Ward. The film contains a lot of thinking outside the box steelheader stuff, like how to get your fly down through 6-8 feet of fast, cold winter water to resting steelhead. Basalt bedrock rivers like the North Umpqua require different techniques than say, the Skagit, so Scott shows us how to do it. And there's a lot of classic water fished in a more traditional way.